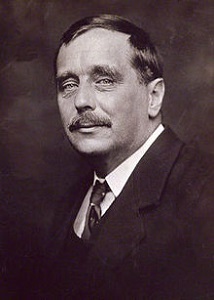 Herbert George Wells was born in Kent in 1866 and, although he wrote in many genres, Wells is generally best remembered for his works of science fiction, such as The Invisible Man and The War of the Worlds. Wells wrote his short story The Red Room in 1896. It’s a Gothic horror story about a man who spends a night in a haunted room, hoping to prove that it is not haunted at all. “I said-it’s your own choosing,” said the man with the withered arm, when the coughing had ceased for a while. “Why don’t you drink?” said the man with the withered arm, pushing the beer towards him. The man with the shade poured out a glassful with a shaky hand that splashed half as much again on the deal table. A monstrous shadow of him crouched upon the wall and mocked his action as he poured and drank. I must confess I had scarce expected these grotesque custodians. There is to my mind something inhuman in senility, something crouching and atavistic; the human qualities seem to drop from old people insensibly day by day. The three of them made me feel uncomfortable, with their gaunt silences, their bent carriage, their evident unfriendliness to me and to one another. “Have I got that right?” I said, and repeated his directions. He corrected me in one particular. “And are you really going?” said the man with the shade, looking at me again for the third time, with that queer, unnatural tilting of the face. “It is what I came for,” I said, and moved towards the door. As I did so, the old man with the shade rose and staggered round the table, so as to be closer to the others and to the fire. At the door I turned and looked at them, and saw they were all close together, dark against the firelight, staring at me over their shoulders, with an intent expression on their ancient faces. “Good-night,” I said, setting the door open. “It’s your own choosing,” said the man with the withered arm. I must confess that the oddness of these three old pensioners in whose charge her ladyship had left the castle, and the deep-toned, old-fashioned furniture of the housekeeper’s room in which they foregathered, affected me in spite of my efforts to keep myself at a matter-of-fact phase. They seemed to belong to another age, an older age, an age when things spiritual were different from this of ours, less certain; an age when omens and witches were credible, and ghosts beyond denying. Their very existence was spectral; the cut of their clothing, fashions born in dead brains. The ornaments and conveniences of the room about them were ghostly-the thoughts of vanished men, which still haunted rather than participated in the world of today. But with an effort I sent such thoughts to the right-about. The long, draughty subterranean passage was chilly and dusty, and my candle flared and made the shadows cower and quiver. The echoes rang up and down the spiral staircase, and a shadow came sweeping up after me, and one fled before me into the darkness overhead. I came to the landing and stopped there for a moment, listening to a rustling that I fancied I heard; then, satisfied of the absolute silence, I pushed open the baize-covered door and stood in the corridor. I entered, closed the door behind me at once, turned the key I found in the lock within, and stood with the candle held aloft, surveying the scene of my vigil, the great red room of Lorraine Castle, in which the young duke had died. Or, rather, in which he had begun his dying, for he had opened the door and fallen headlong down the steps I had just ascended. That had been the end of his vigil, of his gallant attempt to conquer the ghostly tradition of the place, and never, I thought, had apoplexy better served the ends of superstition. And there were other and older stories that clung to the room, back to the half-credible beginning of it all, the tale of a timid wife and the tragic end that came to her husband’s jest of frightening her. And looking around that large sombre room, with its shadowy window bays, its recesses and alcoves, one could well understand the legends that had sprouted in its black corners, its germinating darkness. My candle was a little tongue of light in its vastness, that failed to pierce the opposite end of the room, and left an ocean of mystery and suggestion beyond its island of light. I resolved to make a systematic examination of the place at once, and dispel the fanciful suggestions of its obscurity before they obtained a hold upon me. After satisfying myself of the fastening of the door, I began to walk about the room, peering round each article of furniture, tucking up the valances of the bed, and opening its curtains wide. I pulled up the blinds and examined the fastenings of the several windows before closing the shutters, leant forward and looked up the blackness of the wide chimney, and tapped the dark oak panelling for any secret opening. There were two big mirrors in the room, each with a pair of sconces bearing candles, and on the mantelshelf, too, were more candles in china candlesticks. All these I lit one after the other. The fire was laid, an unexpected consideration from the old housekeeper,-and I lit it, to keep down any disposition to shiver, and when it was burning well, I stood round with my back to it and regarded the room again. I had pulled up a chintz-covered arm-chair and a table, to form a kind of barricade before me, and on this lay my revolver ready to hand. My precise examination had done me good, but I still found the remoter darkness of the place, and its perfect stillness, too stimulating for the imagination. The echoing of the stir and crackling of the fire was no sort of comfort to me. The shadow in the alcove at the end in particular, had that undefinable quality of a presence, that odd suggestion of a lurking, living thing, that comes so easily in silence and solitude. At last, to reassure myself, I walked with a candle into it, and satisfied myself that there was nothing tangible there. I stood that candle upon the floor of the alcove, and left it in that position. By this time I was in a state of considerable nervous tension, although to my reason there was no adequate cause for the condition. My mind, however, was perfectly clear. I postulated quite unreservedly that nothing supernatural could happen, and to pass the time I began to string some rhymes together, Ingoldsby fashion, of the original legend of the place. A few I spoke aloud, but the echoes were not pleasant. For the same reason I also abandoned, after a time, a conversation with myself upon the impossibility of ghosts and haunting. My mind reverted to the three old and distorted people downstairs, and I tried to keep it upon that topic. The sombre reds and blacks of the room troubled, me; even with seven candles the place was merely dim. The one in the alcove flared in a draught, and the fire-flickering kept the shadows and penumbra perpetually shifting and stirring. Casting about for a remedy, I recalled the candles I had seen in the passage, and, with a slight effort, walked out into the moonlight, carrying a candle and leaving the door open, and presently returned with as many as ten. These I put in various knick-knacks of china with which the room was sparsely adorned, lit and placed where the shadows had lain deepest, some on the floor, some in the window recesses, until at last my seventeen candles were so arranged that not an inch of the room but had the direct light of at least one of them. It occurred to me that when the ghost came, I could warn him not to trip over them. The room was now quite brightly illuminated. There was something very cheery and reassuring in these little streaming flames, and snuffing them gave me an occupation, and afforded a helpful sense of the passage of time. Even with that, however, the brooding expectation of the vigil weighed heavily upon me. It was after midnight that the candle in the alcove suddenly went out, and the black shadow sprang back to its place there. I did not see the candle go out; I simply turned and saw that the darkness was there, as one might start and see the unexpected presence of a stranger. “By Jove!” said I aloud; “that draught’s a strong one!” and, taking the matches from the table, I walked across the room in a leisurely manner, to relight the corner again. My first match would not strike, and as I succeeded with the second, something seemed to blink on the wall before me. I turned my head involuntarily, and saw that the two candles on the little table by the fireplace were extinguished. I rose at once to my feet. “What’s up?” I cried, with a queer high note getting into my voice somehow. At that the candle on the wardrobe went out, and the one I had relit in the alcove followed. “Steady on!” I said. “These candles are wanted,” speaking with a half-hysterical facetiousness, and scratching away at a match the while for the mantel candlesticks. My hands trembled so much that twice I missed the rough paper of the matchbox. As the mantel emerged from darkness again, two candles in the remoter end of the window were eclipsed. But with the same match I also relit the larger mirror candles, and those on the floor near the doorway, so that for the moment I seemed to gain on the extinctions. But then in a volley there vanished four lights at once in different corners of the room, and I struck another match in quivering haste, and stood hesitating whither to take it. I turned to where the flames were still dancing between the glowing coals, and splashing red reflections upon the furniture, made two steps towards the grate, and incontinently the flames dwindled and vanished, the glow vanished, the reflections rushed together and vanished, and as I thrust the candle between the bars darkness closed upon me like the shutting of an eye, wrapped about me in a stifling embrace, sealed my vision, and crushed the last vestiges of reason from my brain. The candle fell from my hand. I flung out my arms in a vain effort to thrust that ponderous blackness away from me, and, lifting up my voice, screamed with all my might-once, twice, thrice. Then I think I must have staggered to my feet. I know I thought suddenly of the moonlit corridor, and, with my head bowed and my arms over my face, made a run for the door. It was very slowly I recovered my memory of my experience. “You believe now,” said the old man, “that the room is haunted?” He spoke no longer as one who greets an intruder, but as one who grieves for a broken friend.